French Onion Soup has always been one of my favorite soups. 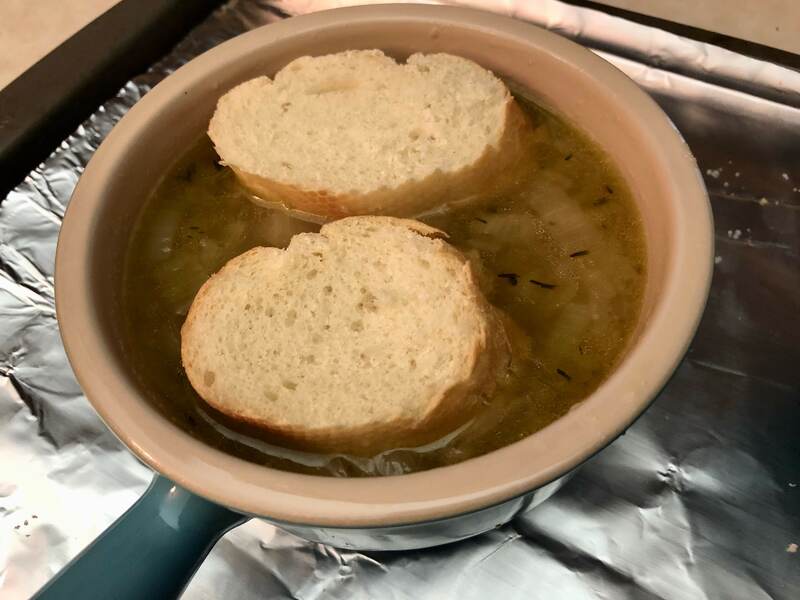 Traditional French Onion soup is a soup based on meat stock and onions, served with croutons or bread and grated cheese on top. 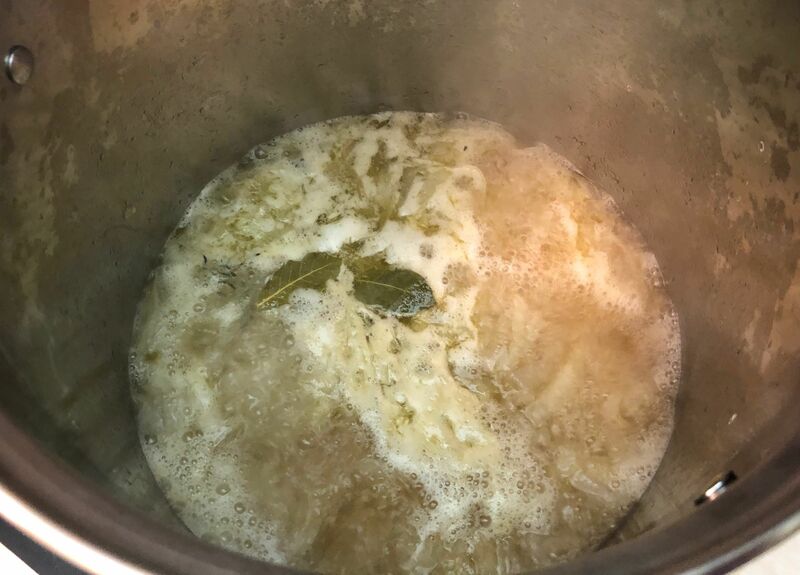 Usually beef stock is used but my recipe calls for chicken stock. 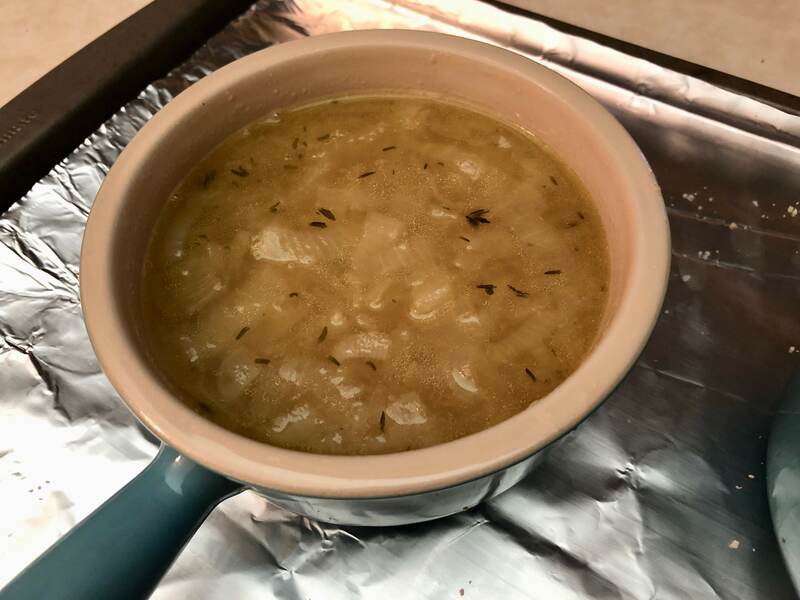 The reason I use stock is it creates a slightly thicker liquid as opposed to broth, and the chicken stock yields better flavor in this dish (in my opinion). Start by slicing the onions. The recipe calls for 8 medium white onions. 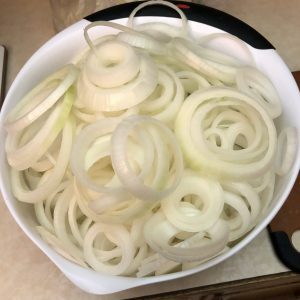 The onions I bought were quite large, so I only used 4 of them. 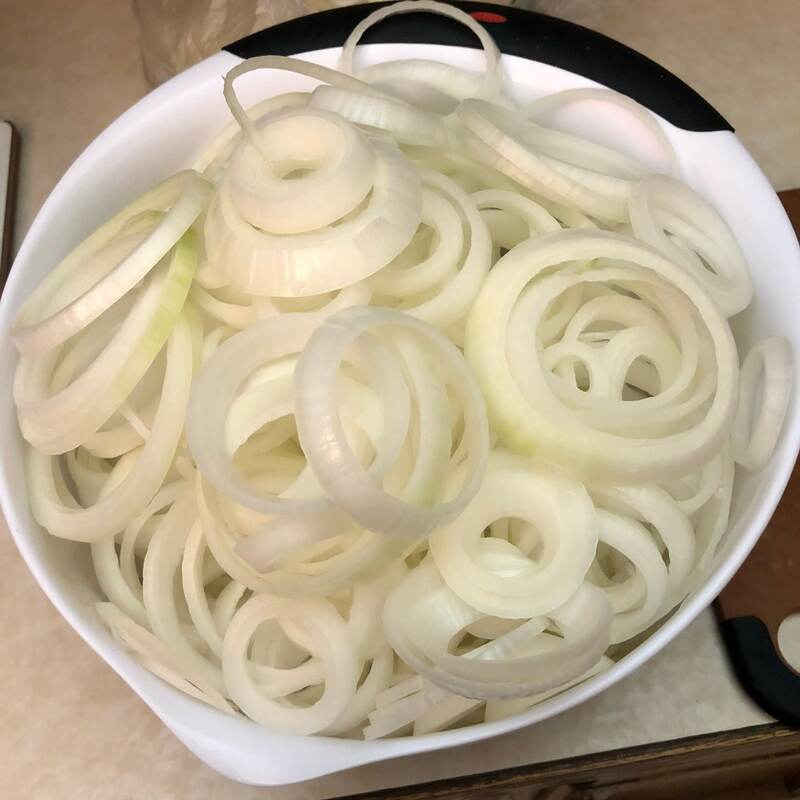 Slice the onions into rings and break the rings apart. Coat the bottom of a large, deep pot with olive oil. Add the onions, generously sprinkle with salt, and stir to coat. 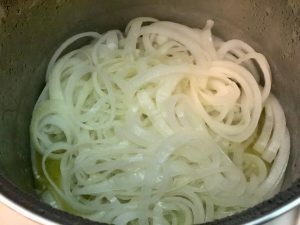 Turn the burner to medium heat, cover the pot, and let the onions sweat for about 15-20 minutes. “Sweating” means to cook the onions until they are translucent and giving off liquid, over a low enough heat that they don’t caramelize. I check on mine every 5 minutes or so and stir to make sure none of the onions are sticking to the bottom of the pot. 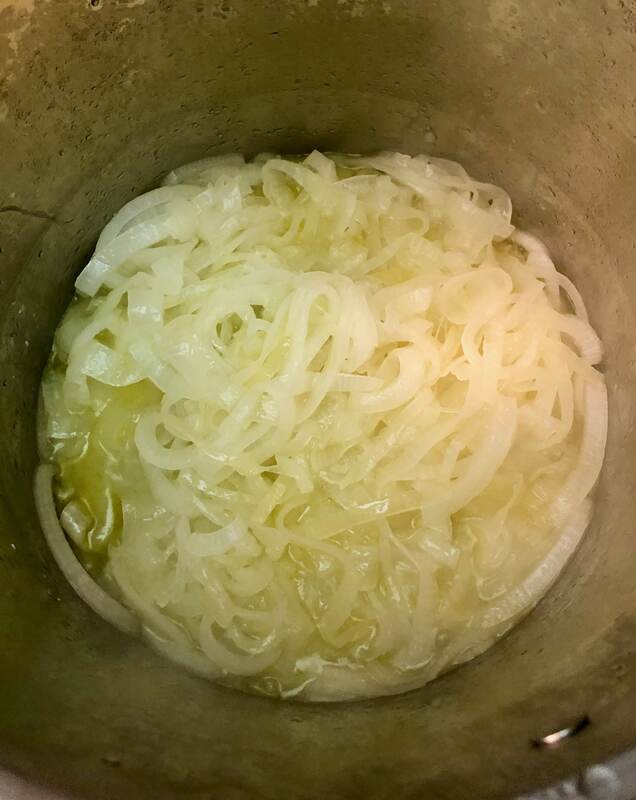 Once the onions are translucent and let off a lot of water, remove the lid, reduce the heat to low, and let the onions cook for about one hour. They should develop a rich brown color. Cooking the onions over low heat will mellow the flavor and release a sweetness that makes this soup delicious. If you don’t want to wait an hour, you can keep the heat around medium and cook for about 30-40 minutes. 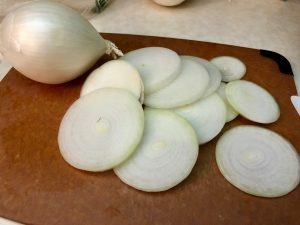 The onions won’t be a rich brown color but more of a yellow. The soup will still taste great with this option. After the hour has passed and the onions are a rich brown color, add the sherry and cook until it has reduced by about half. The onions will also be considerably smaller at this point. Do you see why you need such a deep pot? 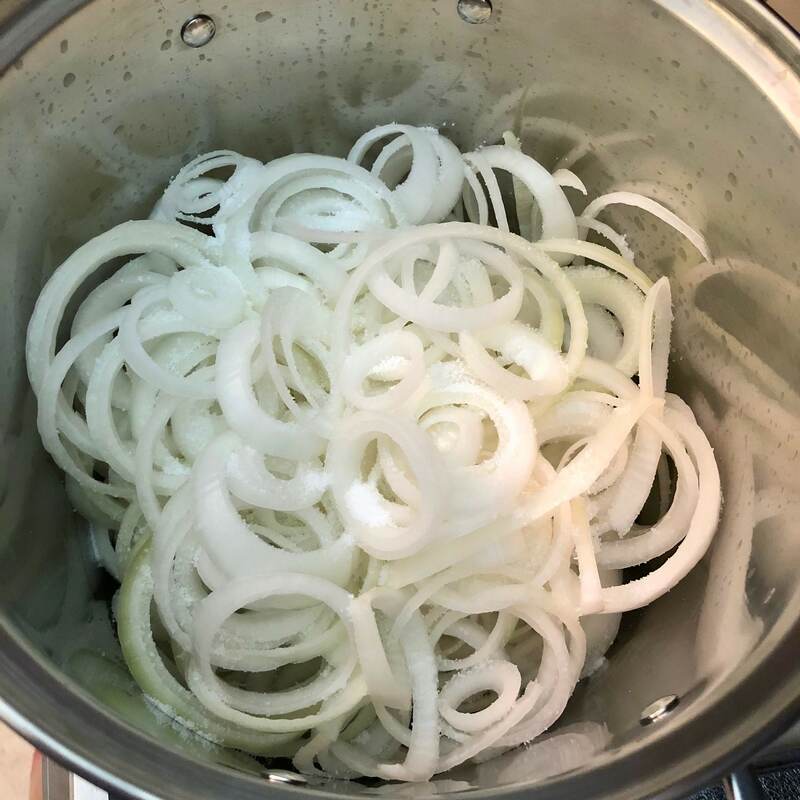 Mine was about ¾ full of onions when I started and once the onions have cooked for a substantial period of time, they took up a few inches of the pot. Next add the bay leaves and thyme. 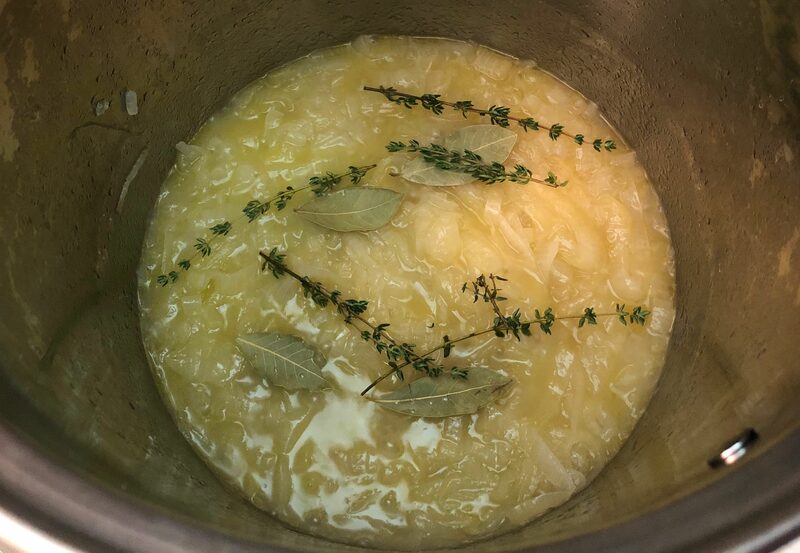 I like to use fresh thyme because I think the flavor of the soup turns out better. If you don’t have fresh thyme that’s ok too. You can use thyme found in a spice container. Also add the chicken stock at this time. Bring the soup to a boil, reduce the heat to simmer, and let the soup cook for about one hour. Taste the soup for seasoning and add salt if necessary. 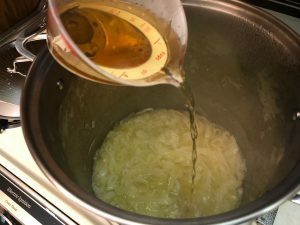 I didn’t think additional salt was needed because I added a decent amount when starting to cook the onions, but you can adjust to your own liking. 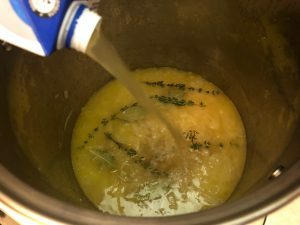 If the stock reduces too much over the hour you can add water to keep the liquid level up. When the soup is almost done cooking, turn your oven to 350 degrees. 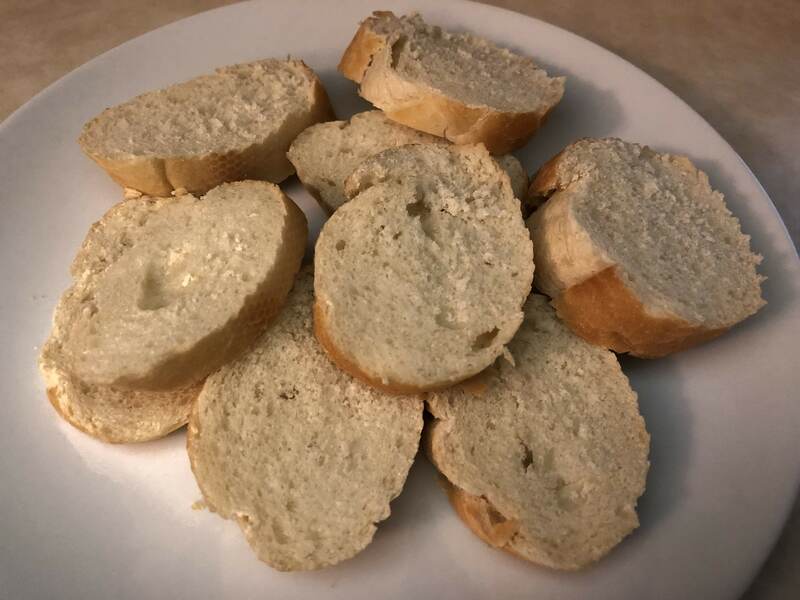 Slice a baguette and toast for about 5 minutes. When the baguette is done cooking, turn the oven to broil. 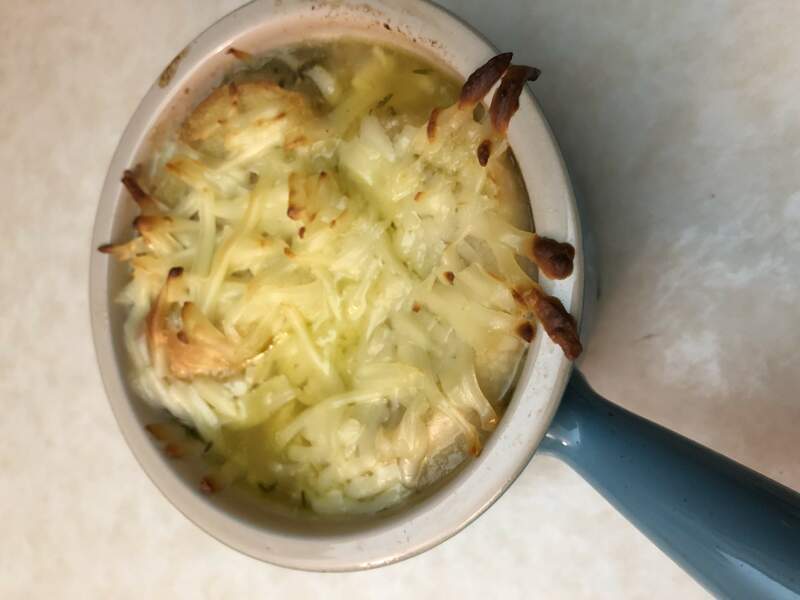 Ladle the soup in to oven safe bowls, filling about ¾ of the way. 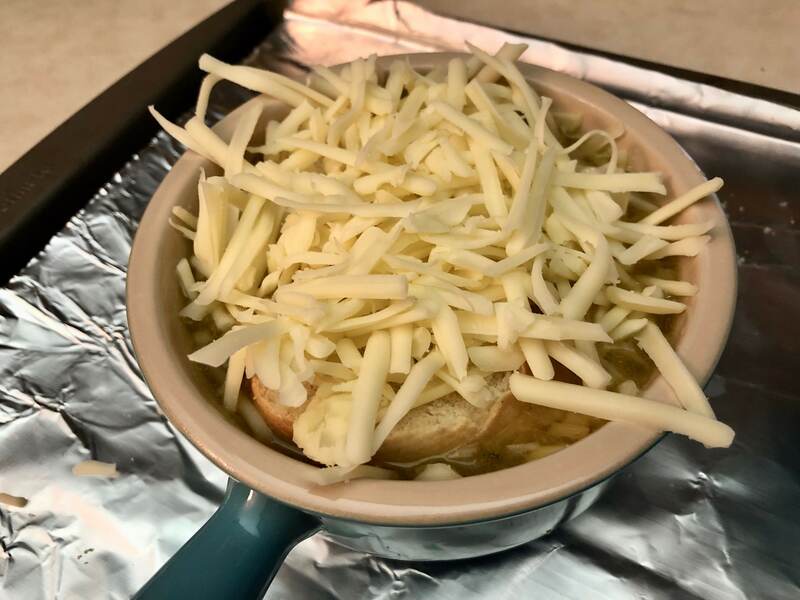 I used crocks, but you can use an individual sized oven safe bowl. Add 2-3 slices of the baguette to the top of the soup, depending on how large the bowl is. 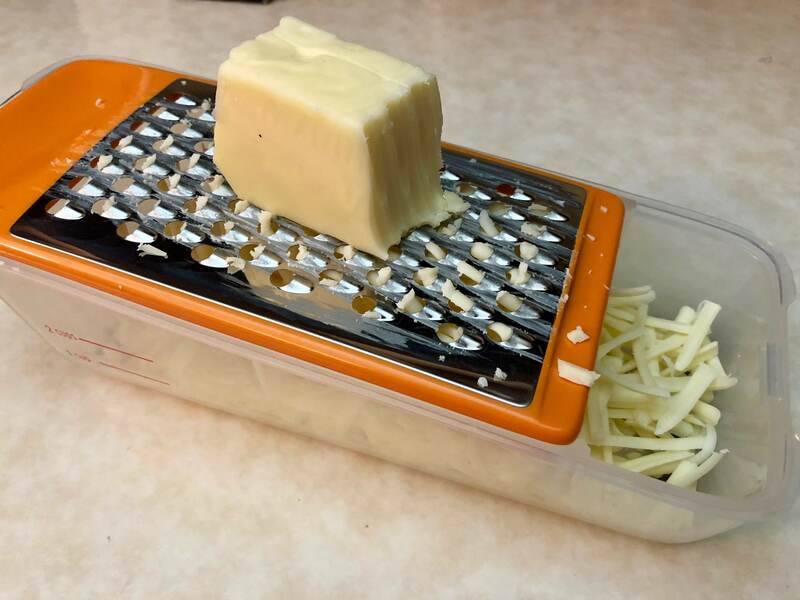 Then top with shredded Gruyere cheese. Broil for about 5-7 minutes or until the cheese has melted and is starting to turn a golden-brown color. Remove from the oven and enjoy – but be careful! The soup and bowl will be very hot! I put each crock on a trivet or pot holder before putting on the table to eat to make sure I don’t burn the table. 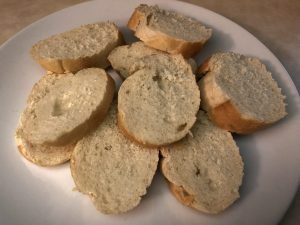 I also like to serve with the leftover baguette pieces – these are great to dip into the soup! And enjoy! Trust me, this soup is worth the cook time and wait! 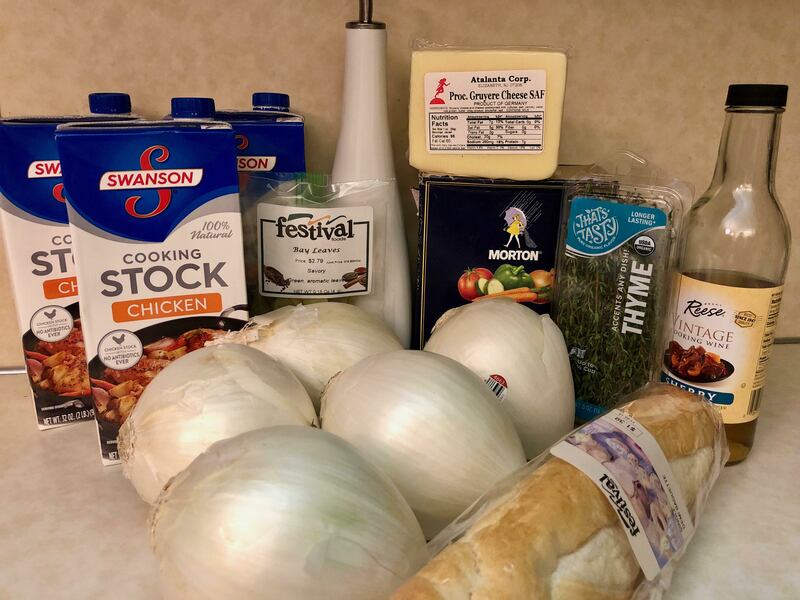 This entry was posted in Uncategorized and tagged Baguette, French Onion, Soup. Bookmark the permalink.